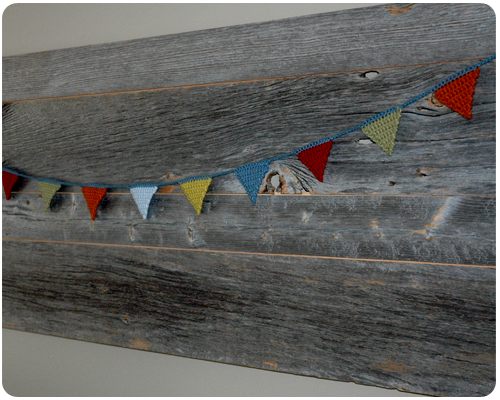 That all being said, I did manage to complete one project this past weekend: nothing huge, just some fun, whimsical crochet bunting to hang on the barn board in our living room. I used my leftover yarn from the Garden Patch Granny Afghan and my Granny Cushion, though much fewer colors as my stash of these yarns is dwindling. Cheerful and cozy, don't you think? Once I hung the bunting, Steve commented to me that perhaps that we have enough crochet stuff in the living room using this yarn. He does have a point - between the blanket, the pillow, and now the bunting - there is a lot of these colors...but they are so pretty together. I did pack the remaining yarn (and there is not much) away in my yarn bin for another time....but that in no way means that I do not already have a few ideas of what to make next.